Special dishes again, I am happy to share that I have stumbled across a great recipe, that works for me really well for more than a month now. And also I took pleasure in following every word of it. Originally, pastel is a typical fast-food Brazilian dish, consisting of half-circle or rectangle-shaped thin crust pies with assorted fillings, fried in vegetable oil. The result is a crispy, brownish fried pie. The most common fillings are ground meat, mozzarella, heart of palm, catupiry cream cheese, chicken and small shrimp. Pastéis with sweet fillings such as guava jam with Minas cheese, banana and chocolate also exist, but are not so common. The pastel is classified in Brazilian cuisine as a salgado (salty snack). It is traditionally sold on the streets or in fast-food shops known as pastelarias. It is popularly said to have originated when Japanese immigrants adapted Chinese fried wontons to sell as snacks at weekly street markets. This is the most likely hypothesis as even today many of the "pastelarias" are owned or run by Chinese and Japanese immigrants. 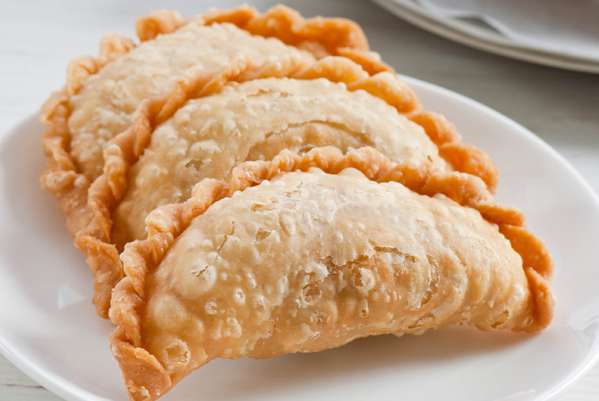 Italian Brazilians have said the Brazilian dishes pastel and fogazza originated from fried calzones. It is possible, however, that pastel originated from Indian samosas when the dish became part of the Portuguese cuisine. A common beverage to drink with pastéis is sugarcane juice. Our version of curry puff is almost similar with the ones in Malaysia or Singapore. I don’t know the difference yet though. The puff is made from butter and flour, very flaky when fried. The fillings are some meat, potatoes and carrots cooked with generous curry paste. A lot of patience is needed, but they can be prepared in advance, fried half way done and frozen. The dish called for a lot of prep work to be done in advance. Potatoes need to be cubed and browned in advance. Carrot needs to be cubed too, boiled and drained. Chicken needs to be cubed. Living in South East Asia does have its perks. One of which is you can always buy freshly ground spice paste. You can go to any traditional morning (and wet) market and you can find spice stall. Come up to one and just let the seller know what you are going to cook. Be it curry, soup, soto. She will scoop up each of shallot, garlic, turmeric, galangal, or whatever supposed to be in each dish, already in form of paste, into plastic bags. Dried spices are given too. It really is much more exciting to grind spice paste myself, like what I have been doing in the blog posts so far. It does save a lot of time to buy. This 20 g (about 4 tbsp) curry paste cost about 10 cent and the curry leaves came along with it. Any medium-to-large grocery also carry their own fresh spice paste section, like Carrefour. The spices are so fragrant, they’d make you want to buy everything! But since they are fresh paste, with no preservatives (hopefully), they don’t really keep well. So you should just get as much as you need. Substitute this with ready-to-use instant / jar curry paste. Any kind would do. I’d go with red curry paste. First, start preparing the filling. Stir-fry chopped onion with a little bit of oil in a wok till fragrant over medium heat. Add the spice paste into the wok. Cook till it changes color and smells really, really great. Add cubed chicken meat. Or beef. If you opt for vegetarian version, omit the whole thing. Add some sugar and salt. Sugar will bring out the flavor. If you are using instant curry paste, check the packaging if any sugar / salt is needed. Toss in pan-fried potato cubes. Stir everything well for a couple of minutes before adding coconut milk. And some flour to thicken the sauce without cooking out the liquid. Make sure to cook for a while so that the flour combined well with the rest of the filling without leaving the nasty floury taste. Don’t worry when the filling looks a bit wet. It will dry out on standing while waiting for the pastry skin. If you like, add a handful of shallot flakes into the curried filling. They marry well. You don’t really need a mixer to work on the puff skin. But I just love my mixer too much to leave it out of the action. Combine flour, butter and water in a mixer bowl or kitchen counter. Mix using paddle attachment for less than a minute, medium speed. If using hand, knead till all ingredients are nicely distributed. The dough will be on a very sticky side. Sprinkle your hand generously with flour and form a ball. Place the dough on your kitchen counter and cover with clean kitchen towel. Let rest for 10 minutes. Combine the second set of ingredients for butter dough in the same bowl. Use paddle attachment to process it into crumbly dough. If you use your hand, crumble the butter and flour together. Press the crumble together to form a ball. Flatten it and form into a square block. On a floured surface, roll out water dough to a 30 x 30 cm square. Place the butter dough block in the middle. Fold the sides of the dough to the middle of the smaller dough. Flip the packet. Slowly roll the packet into a larger rectangle. Fold the dough by taking both ends to the middle part. Fold it into two so that the inside seam of the first folding is invisible. Turn the dough 90degree to the left. Leave for 10 minutes, covered. Roll the dough out to a bigger rectangle. Again, turn the dough 90 degree to the left. Cover and let rest for 10 more minutes. If you wish, you can go back to the first step, folding the dough to four parts. Or just go to this part. Roll it out to bigger rectangle and thinner. Use your pastry cutter to divide the rectangle into two, right in the middle. Roll each one tightly, but not too tight. Now you will have two rolls of puff pastry. Divide each roll into 10 blocks. About 20 g each block. Cover and let rest for 10 minutes. Dip each block into flour and place the cut side up. Roll it out to thin circle. Not too thin, about 2mm thickness is suffice. Can you see the spiral? Do the same to the rest of the dough. Cover and let rest for 10 minutes. Place a couple of spoonfuls of filling right in the middle of pastry skin. Close the sides into small moon-shaped. Squeeze the sides together firmly. Pleat the side nicely. I wish I grow two more sets of hands so I can take better shots of how to pleat! Heat some oil in a wok over low heat. Drop the puff into the warm oil. As the temperature increased, the puff that was at the bottom of the wok will float up. It is important not to start frying with high heat since the skin in the middle part will cook far too quickly before the pleated part is. Cook for 5 minutes each side. Remove from heat and drain on paper towel. All nicely puffed and fried. Heat cooking oil in a wok. Stir-fry chopped onion till fragrant for 30 seconds. Add curry paste into the wok. Cook till it changes color, a shade darker. Combine the rest of the ingredients into the wok. Chicken pieces, potato cubes, carrot cubes, peas. Cook for a couple of minutes over low heat. Add coconut milk. Mix well with other ingredients. Lastly, add flour. Let cook for a minute longer and remove from heat. Set aside. Mix all ingredients for water dough to a ball shape. Knead by hands or machine. Let rest, covered with kitchen towel. Do the same with butter dough ingredients. Roll water dough into a 30x 30 rectangle. Place butter dough right in the middle and fold water dough on top of it. Flip the dough packet over and slowly roll the dough into long rectangle. Fold the rectangle into three and lightly press the dough. Turn the dough to the left, 90 degree. Cover and let rest for 10 minutes. Continue the folding and turning two more times with 10 minutes resting period. Roll the dough into thin rectangle. Divide the sheet into two smaller sheets. Grab one end and start rolling towards you. You will end up with two rolls. Let rest for 10 minutes, covered. Cut each roll into 10 equal pieces. Rest for 10 minutes, covered. Generously sprinkle flour on each piece and place them on counter, cut side up. Use a rolling pin to roll the dough into round disk, about 2mm thick. Do this with the rest of the dough. Let rest and covered for 10 minutes. Fill each skin with 2 tbsp of curry filling. Fold the pastry into half moon shaped and pleat the sides neatly. Do the same with the rest of the skin. Heat cooking oil in a wok, enough to simmer the pastry, over low heat. Fry the pastries, two or three at a time, without crowding the wok. When the pastries float to the top of the oil, increase the heat to medium. Cook for 3-5 minutes each side, till golden brown.